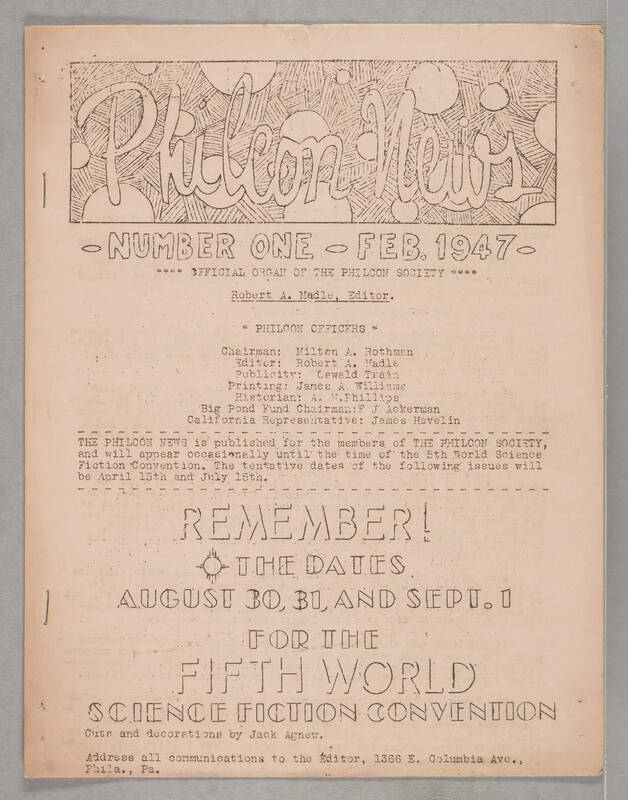 Philcon News Number One - Feb. 1947 **** Official Organ of the Philcon Society ***** Robert A. Madle, Editor. Philcon Officers Chairman: Milton A. Rothman Editor: Robert A. Madle Publicity: Oswald Train Printing: James A. Williams BIg Pond Fund Chairman: F J Ackerman California Representative: James Hevelin THE PHILCON NEWS is published for the members of THE PHILCON SOCIETY, and will appear occasionally until the time of the 5th World Science Fiction Convention. The tentative dates of the following issues will be April 15th and July 15th. Remember! The Dates August 30, 31, and Sept. 1 For the Fifth World Science Fiction Convention Cuts and decorations by Jack Agnew. Address all communications to the Editor, 1366 E. Columbia Ave., Phila., Pa.